Here’s a decadent little recipe to take a break from your local / seasonal / sustainable routine. 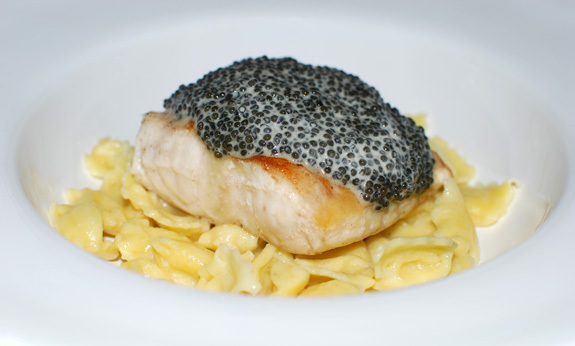 I named the dish after the city of Astrakhan in the Volga delta, (once) renowned for its rich sturgeon population. 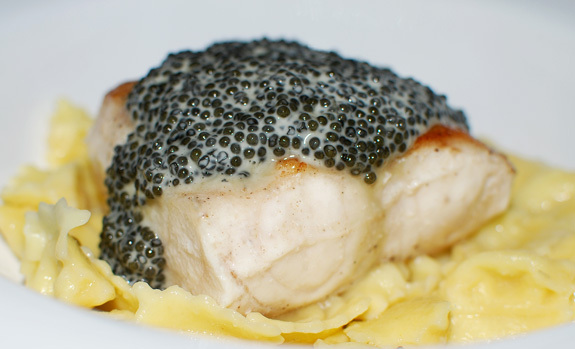 The idea is pretty simple: a thick piece of butter-poached, meaty sturgeon buried under spoonfuls of caviar. Obviously this isn’t a cheap meal, and it would easily reach $100 per person in a restaurant. If you make it at home, though, it doesn’t have to be outrageously expensive. 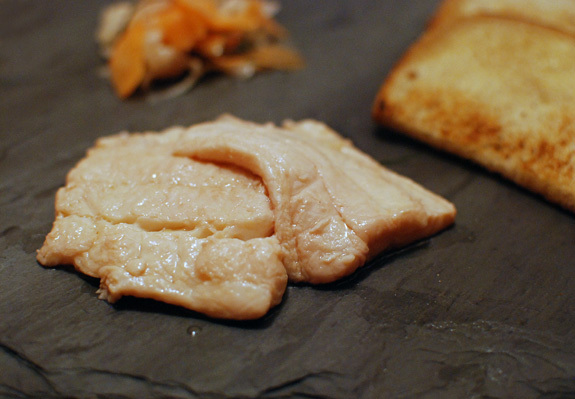 You can find very good and affordable paddlefish roe, and the cost of a portion will be around $30. Just don’t start using other kinds of roe whose only resemblance to caviar is a darkish color. The results won’t be the same! Kelley’s Katch ships anywhere in the US. The Net Cost Market on Sheepshead Bay Road in Brooklyn has a good selection of fish roe (I’ve never been to the other locations). And it’s the mecca of Russian food shopping — you’ll never want to waste your time in other specialty supermarkets anymore. I took the sous-vide cooking time and temperature for sturgeon from Thomas Keller’s Under Pressure: Cooking Sous-Vide. Don’t be discouraged by the whole water bath thing, this is a very easy recipe! If you just have a thermometer, it’s not that hard to maintain a pot of water at a fixed temperature for a few minutes by adding hot or cold water. The only special sous-vide gear you really need is a vacuum pump like this one from Ziploc, and a few bags that go with it. 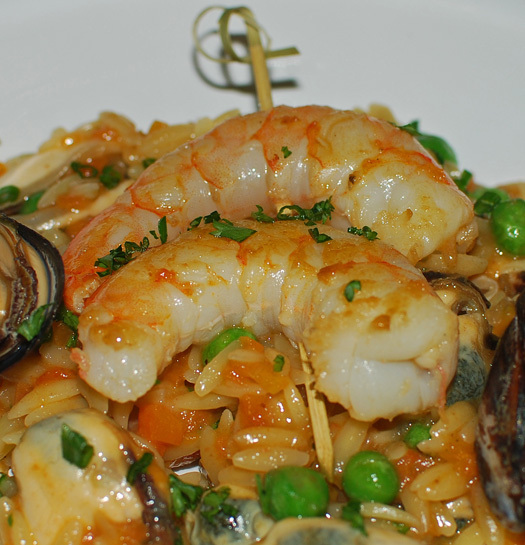 Finally, the dish is pictured below with goat cheese agnoletti. Next time I serve it, I would try some veal pelmeni tossed with haricots vets and butter instead. Green beans go surprisingly well with caviar, and I love the veal-fish association. Take the caviar out of the fridge. In a small saucepan, heat the sour cream to a simmer, then remove from heat and let cool until lukewarm. Weigh 2 oz, and discard the rest. Gently mix the caviar with the sour cream using a spoon, and reserve. The sauce should be served near room temperature. Don’t reheat it, or the roe will be ruined. Season the sturgeon with salt on both sides, then place in sous-vide pouches with the butter. Cook in a water bath at 142 F for 16 minutes. Take the fish out of the pouches, pat dry, and sear in clarified butter in a hot pan for a few seconds. Serve immediately, topped with the caviar sauce. This is my last lake trout recipe for a while, I promise! Not only do these sausages buy you a couple days before you have to eat them (because you have to eat your trout tartare and your seared trout fillets first, remember? 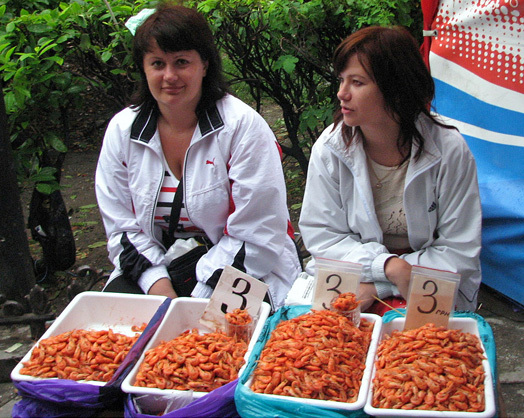 ), they also make use of a lot of fish trimmings. I serve them with a simple mix of thinly sliced onion and fennel tossed with salt, sumac, chives, lemon juice and olive oil. Natural sausage casings can be purchased here. As far as hardware is concerned, if you have a KitchenAid stand mixer, the food grinder and sausage stuffer attachments will do a perfect job as long as you don’t plan to start your own commercial operation. This recipe also makes fish stock. You can freeze the stock and use it for another recipe, such as a fish soup, into which you could blend any leftover trout trimmings, as well. Season the heads and bones with salt and pepper, and sauté in olive oil over high heat in a pressure cooker without the lid. Add the onion and garlic, and cook for a few minutes, stirring constantly. Add the white wine, bring to a boil and simmer for a couple minutes. Add the thyme, parsley and water. Cover and pressurize over medium heat, then cook for 20 minutes. Let cool. Pass the liquid through a chinois and reserve for another recipe. Pick the meat from the fish heads and bones. You can keep the lean flesh, the fat, the gelatinous head matter — taste it and decide! Keep in mind this will all be blended in the sausages, so you can err on the adventurous side (do you know what meat parts are used in hot dogs?!). The amount will vary greatly based on your choice, but you should have at least 10 oz. Let cool and refrigerate. Soak the sausage casings in a bowl of water in the refrigerator for 24 hours. In a small saucepan, melt 1/4 of the butter over medium heat, add the rice and cook for 1 minutes. Season with salt, stir in 1/3 of the chicken stock, cover and cook over low heat until the liquid is fully absorbed. Add the rest of the chicken stock in 2 more pours, until the rice is cooked. Mix in the rest of the butter and let cool. Transfer the rice to a blender with the ice cubes, trout trimmings, smoked salt, Urfa pepper and onion powder, and blend until smooth. Grind the trout fillet using the large die of the grinder. Combine with the blended mixture and the chives, and refrigerate for at least 30 minutes. 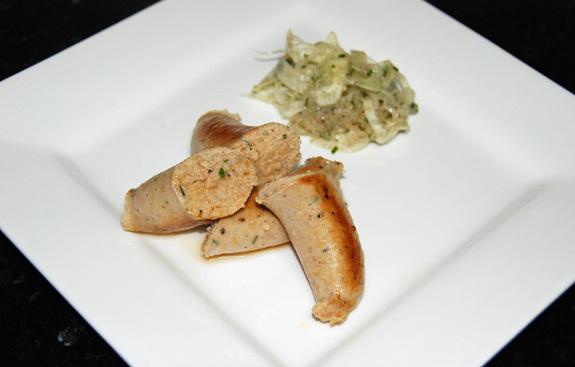 Rinse the inside and outside of the casings with cold water, pat dry, and stuff using a sausage maker. Refrigerate the sausages, loosely covered, for at least 24 hours. To serve, poke the sausages with a fork on all sides, and sauté in olive oil over low heat, turning regularly. So you’ve caught all that trout, you’ve pan-seared or cured the best fillets, and you still have plenty of fish left. Pickle it! This recipe is perfect for smaller fish, as pickling will dissolve the bones, sparing you the tedious task of removing them. Moreover, the jars can be kept refrigerated for over a month. If you find that the result tastes too much like vinegar, strain the trout and vegetables and mix them with sour creamthe day before serving (you can add back a little bit of the pickling liquid if you wish). You could also try adapting my recipe for Dill and Sour Cream Marinated Shad, though the jar won’t keep nearly as long with that one. Slice the carrot and shallot very thinly using a mandoline. Transfer to a bowl and add the thyme and fennel green. Place the salt, sugar, vinegar, oil and orange juice in a blender, and process until smooth. Pour into the bowl and mix. Cut the trout into pieces 2″ to 2 1/2″ long. 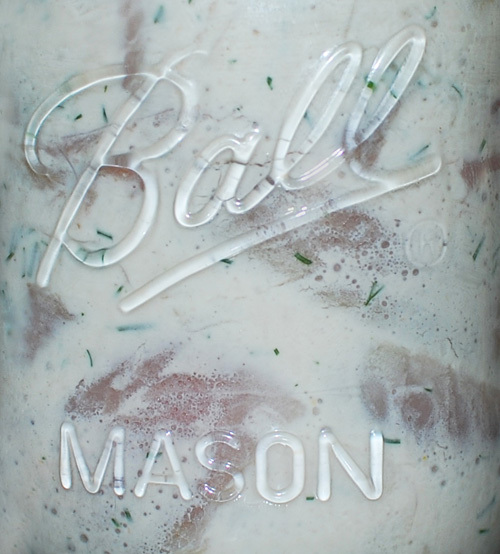 In sterilized pint jars, arrange successive layers of vegetable mixture and trout, and top with the liquid mixture. Refrigerate for at least 3 days. Remove from the fridge about 30 minutes before serving, and eat with toasted rye bread. 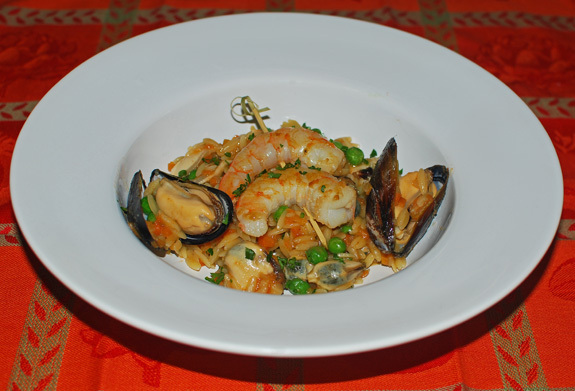 Following our successful Keuka Lake fishing trip, I have a few more trout recipes to share with you. Since I don’t want to freeze fish when I can avoid it, and I can only eat so much while it’s fresh, I had to come up with a number of curing and marinating plans. This one involves vodka and is particularly successful: instead of giving a marked alcohol taste to the fish, the vodka blends in and produces a very mellow result. If you want to add some smoke flavor, you can substitute half or all of the salt with smoked salt. The cured fish can be wrapped in plastic film and kept in the fridge for a couple weeks. Serve with blini and sour cream, or bagels and cream cheese. 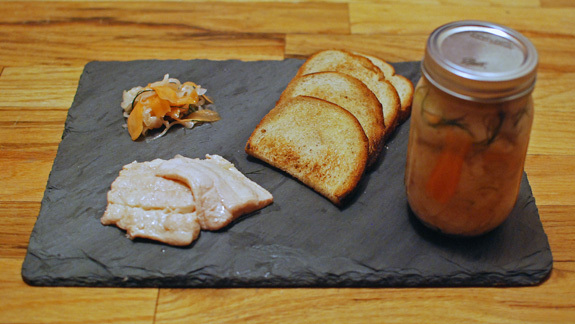 ETA: Over the years, this has become one of my favorite cured trout recipes. 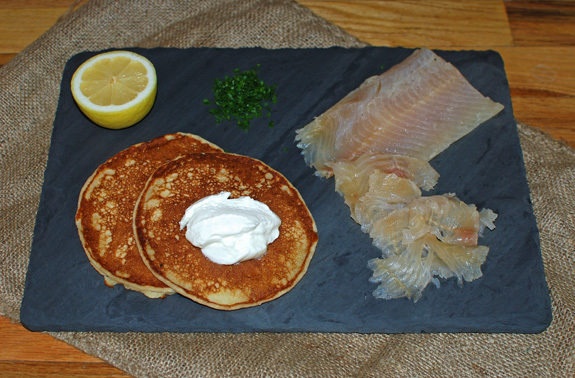 I’ve added pictures of different batches, all prepared with lake trout from the Finger Lakes. Some of these lakers, especially from Cayuga Lake, have a much more orange flesh. In a blender, mix the salt, pepper, sugar, olive oil and vodka. Place the trout and the curing mix into a plastic pouch, and refrigerate for 48 hours. Flip every 12 hours, making sure the fish remains completely coated in the liquid. Take the fillet out of the pouch, rinse under cold water and pat dry. Slice very thinly and serve. On a visit to the Finger Lakes last weekend, we spent a morning trout fishing on Keuka Lake with Fisherman John. When he’s not teaching freshwater angling and fly fishing at Cornell University, John is on the lakes nearly every other day all year long, and you can trust him to figure where and when the action is. We had a slow start, but around 10 am the bite picked up for about an hour, which was long enough for us to land 5 nice lakers, all between 18 and 24 inches! Just like my Quick Seared Trout with Smoked Trout Rillettes, this tartare recipe is simple to make and emphasizes the flavor of the fish. If you want to experience ultimate piscine freshness, you can even mix all the ingredients, put them in a plastic container, take it on the fishing boat and mix in the chopped trout as soon as you catch it! If you prefer the comfort of your dining room, serve the dish with some oven-roasted potatoes and a glass of Keuka Lake Riesling, like this one from Bully Hill Vineyards. Melt the butter in a small saucepan over low heat. Add the fennel, season with salt, cover and cook until soft, stirring regularly. Let cool and refrigerate. Melt the butter in a small saucepan over low heat. Add the zucchini and thyme, season with salt, cover and cook until soft, stirring regularly. Let cool and refrigerate. Mark an X into the bottom of each tomato with a knife, plunge into boiling water for 30 seconds, then shock in ice water. Peel, cut into quarters and seed. Cut the flesh into small dice, measure exactly 1.8 oz and reserve the rest for another use. Season with salt and piment d’espelette and refrigerate. Chop the trout fillets into small dice. Mix with the olive oil, salt and pepper. Spoon the mayonnaise into the egg shells and top with the trout roe. Arrange all the elements on the plates and serve immediately. Originally, a kulebyaka was a closed pie filled with several layers, often separated with pancakes to prevent mixing. The dish could be served at any time during the meal, and fillings consisted of almost anything, including meat, fish, mushrooms, onions, cabbage, buckwheat, hard-boiled eggs — sweet ingredients to create a dessert pie weren’t unheard of either. However, it was only in the 19th century that French chefs who had worked in Russia brought the dish into the international spotlight, after distorting both the recipe and its name. 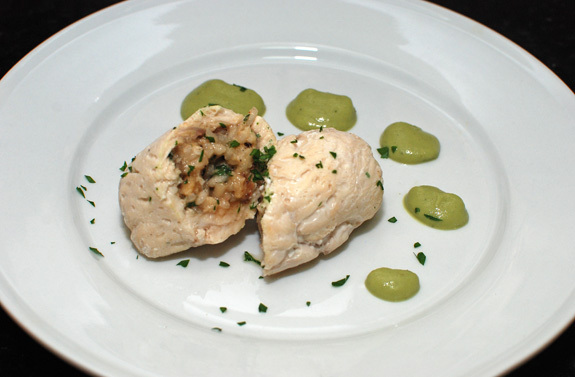 The ingredients of the new coulibiac took a luxurious turn and showed a preference for game, foie gras, salmon, rice, butter, and puff pastry. Nowadays, the dominant version in both Western and Russian restaurants consists of a combination of salmon, rice, mushrooms and hard-boiled eggs. My rendition, partly motivated by a recent meal at M. Wells, is definitely more a coulibiac than a genuine kulebiaka. In fact, the large piece of rare, pink fish, the leek risotto and the salmon roe sauce restore some of the luster to a dish that has too often become a shapeless blob of overcooked salmon (the steak of the sea, industrially farmed to cost as little as possible). Partly freezing the fish is key to obtaining the right doneness (which is only somewhat visible on the pictures below). The timing may vary slightly with your freezer, but the fillet should not be rock solid when you take it out, or it will reject lots of water and make the pastry soggy. Store-bought puff pastry certainly saves a lot of time, but not all doughs are born equal. In particular, beware of the brands that don’t use butter — that’s not really puff pastry anymore! 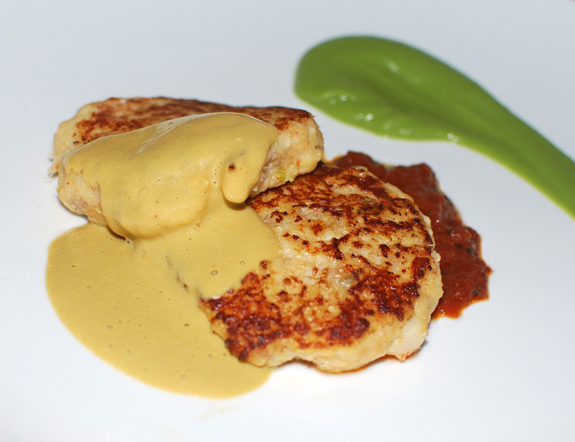 Try this dish with potato knishes. I find that the leftovers are also delicious when served cold. Sauté the leeks with half of the butter in a small saucepan over medium heat for 3 minutes, stirring regularly. Season with salt, add the chicken stock, and simmer until the leeks are soft. Let cool for 5 minutes. Transfer to a blender, add the rest of the butter, and process until smooth. Reserve. Sauté the rice with the olive oil in a small saucepan over medium heat for 1 minute, stirring constantly. Season with salt and pepper, add the white wine, and simmer until almost fully reduced. Add half of the chicken stock, simmer again until almost fully reduced, then repeat with the rest of the stock. Rectify the seasoning and stir in the leek purée. Transfer to a bowl, cover with plastic wrap, and let cool. 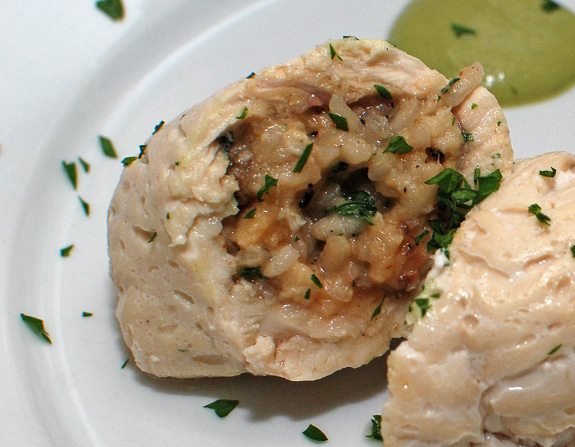 The risotto will still look very runny, and that’s fine: the rice will absorb more liquid. Mix in the chives, and reserve. Place the the salmon on a piece of plastic wrap, fold the fillet lengthwise, and roll into a 13″ long, 2.5″ diameter cylinder. Wrap tightly with another layer of plastic wrap, and freeze for 4 hours. Roll the puff pastry to a 12″ x 15″ rectangle. With the longer side of the rectangle facing you, line with the slices of smoked salmon, leaving 1″ clear on each edge except the one closest to you. Spread the leek risotto on top of the smoked salmon. Unwrap the salmon from the freezer, and position it near the edge of the rectangle closest to you. Brush the exposed puff pastry with egg wash, roll into a cylinder, and seal the dough on both edges. Transfer to a baking sheet lined with greased parchment paper, and brush all sides with egg wash. Bake in a 425 F oven for about 25 minutes, until golden brown. Let rest for 5 minutes while you prepare the sauce, then slice and serve. In a small saucepan, heat the white wine and 1/2 of the sour cream over high heat, and reduce by half. Remove from the heat, and mix in the vodka and the rest of the sour cream. Just before serving, add half of the salmon roe and chives, barely swirling the saucepan to incorporate them. Use the rest of the roe and chives to decorate the dish. I love eating marinated herring in Russian restaurants — except for the “herring under fur coat” salad, which simply looks gross. Sadly, I’ve never or hardly ever seen fresh herrings in stores, so I’ve never prepared my own. Things started looking up when I realized that American shad belongs to the same family and is readily available in season. New York fishermen can catch shads in April during their spawning run in the Delaware River. There’s even a shad festival in May. 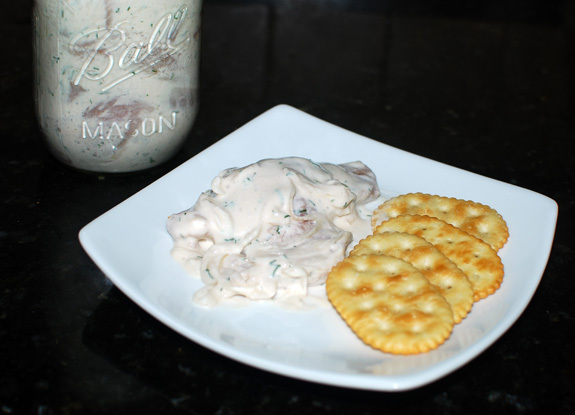 Reading a great recipe for pickled herring got me motivated to take a shot at sour cream marinated shad. Because shad is bigger than herring, you can fairly easily pick out all the small bones, remove the skin, and discard the darker part of the flesh if you find its flavor too strong. 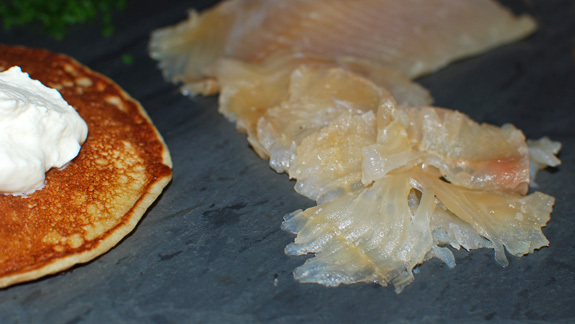 The marinated fish can be kept in the fridge for a couple weeks and tastes delicious with potato pancakes. Slice the onion very thinly with a mandoline and transfer to a bowl. Add the sour cream and dill, and mix well. Dissolve the sugar and salt in the combined vinegar, lemon and orange juices, then mix into the bowl. Cut the shad into pieces 2-3″ long. Add to the marinade and incorporate gently with a spatula. Transfer to glass pint jars, and refrigerate for at least 48 hours. Take out of the fridge 15 minutes before serving.